Long weekend expected to attract anglers. Hello again, Another very quiet week has passed on the river and it would not surprise me if it has not been fished at all in certain places this week. 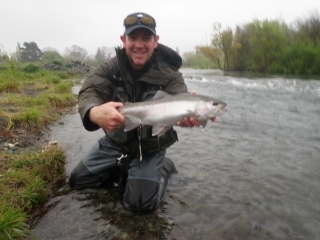 Taupo and Turangi offers some amazing fishing at the moment andwith the weather conditions we have had most rivers will be holding some good fish. The westerly wind has been fairly stiff on the Waytahanuie mouth this week and should have pushed some good sized fish into the upper pools which would be worth exploring. The TT has been pretty good for 6 weeks now with the extra flow and coloured conditions and with a bit of walking you should be able to locate fish in here if you get an early start. Just lately the Hine car park has almost been empty every time I drive past and this should also be good fishing in the deeper holes at the momentÂ . It pays to get to know this water as it can be harsh on the novice and take all of the fly box in the first few pools putting anglers of trying any further, split shot is handy in here. The Labour weekend holiday marks a spot in the calender for me in many ways and I tend to base events and times around this time of year as things really pick me up from this date onwards. In my opinion back country fishing really takes off with dry fly starting to happen on a regular basis, fish start moving about with the warmer waters and the weather seems to let us access most areas which so far this year has been a major part in trips cancelled. I will start to keep my eyeÂ out for good brown trout in the next few weeks as we will once again get a few early spawners moving into the Tongariro. The first big brown which weighed 10 lb caught by Bill Boomer while guided by me in the braids was caught after a flood in October,Â I then caught another in the same spot in November so hopefully this year will be similar. This time of year Lake O fish are putting on weight by the day as the water warms up and snails start moving about on top of the weed beds. Fish here can be fairly easily caught early in the summer stripping small wet flies along the edges of weed beds but some of the fish are still recovering fish from spawning. Better and bigger fish are caught going into summer and this is when we see the larger fish come out of thisÂ lake, the only thing the buggers are twice as smart and twice as hard to catch. If you are searching for a great looking trophy this si where to get one from and the time to fish here is from now till the end of the season. I have also been told that this weekend marksÂ a vital time to plant some certain vegies in the garden and with the new house and all I may have to consider going down that road but will have to consult Pip on all that stuff as she as the green fingers. If I speak really nice to Ross maybe she can stop in once a week in Taupo and give them so blood and bone and makesure their development is positive. Tongariro, Tongariro, Tongariro lets get you anglers inspired to shoot up here and get the faith back with some good fish, first step is to get here as you wont catch a fish if your flea is not in the water. Most of the river now has trout scattered through it and the upper reaches is probably where I will be heading over the weekend as they have not been looked at for some time. Pools that always have fish in them are places like the Stag, Cicada, Admirals, Blue Pool, Silly pool the list goes on and with a little bit of effort youÂ could cover all these places in one day. I will be very shocked if you could not get a fish out of these pools and with a little bit of knowledge of where to fish and how to fish you will do well. Glo bugs should always play part in a Tongariro anglers fly box and they are still taking fish first thing in the morning and on rainy overcast days when the weather turns to custard. With better weather just around the corner I would be concentrating on making sure you had an extensive range of naturals in all different sizes as this is going to be what the trout will be feeding on shortly. Warmer days and warmer nights will see the insect life explode and that means that many of these are starting their life’s at the bottom of the river and making their way to the surface giving us dry fly action but most of all heaps of nymph fishing or emerger fishing opportunities. Always have patterns such as Hare and Coppers, Pheasant tails, GreenÂ andWhite Caddis, Rubber leg variants, Copper johns and the very reliable Prince nymph. Generally in the winter spawning fish don’t really feed and if you knock one on the head and inspect the gut content to see whats in the stomoch you will usually find nothing. I know you have just caught this fish on something that resembles food so they must eat something occasionally but asÂ a rule they just don’t. Try doing this in the next couple of weeks and I think you will find some fish with full stomachs andas the season goes on they will have even more in them. Usually you will find plenty of Caddis , May fly, Cicadas and other bits of mixed up weed and pumice so this should give you an idea of what to match your fly to, pumice is a hard one but you never know. I have again had a lot of fun while winter fishing the Taupo area and scored some fantastic days and great fish but keep getting told about how consistant the Rotoroua fishery is at producing big fish and plenty of them so with a day to spare myself and Mike went to explore and see what all the fuss was about. We stopped in at the Hamills store in Rotoroua and got the latest of where to go and how to do it so we could get straight into all these fish. The Ohau channel has been on fire since opening day so we headed their with our 20 lb tippet, #4 smelt flies and split shot just in case we weren’t getting deep enough. A fast sinking line is needed here and a 8 or 9 wt rod as you are fishing heavy gear for heavy fish , at least that’s what we are told aren’t we? I imagine the channel to be a long big piece of water with plenty of fishing area to get away from people and to let your fish run a little and tire them out before hawling them in but that is just not the case, fishable area where we were must only be the length of the Major Jones pool. The guy in the sport shop when he sold us 20 lb tippet advised us to lock and load, that means when you hook a fish lock the real up and load the rod to resemble a game road fighting a marlin and pump and wind the fish in. Does this sound like trout or fly fishing to you? Doesn’t even look like fly fishing to me but interested to see what it was all about and wanting to hook into something that anglers only dream of me and Mike carried on and actually was excited about the new water. We started fishing the way we knew and watched other anglers flogging away with their wet lines into the brown dirty water which had about an inch clarity to it and it was not long before I had the rod locked and loaded and was into one of these Ohau channel beasts. I pumped and wound him up the current and there it was-a fish of about 2lb which was small and skinny with a hook hanging out of his moth half as long as him, Mike chuckled to himself. We fished for about 7 hours and did not get another touch the highlight of the day would have been when Mike pulled in a rubber glove from the dirty water which took his smelt fly. We spoke with anglers, watched anglers, tried different techniques and prayed to the lord to change our luck but it just did not happen. 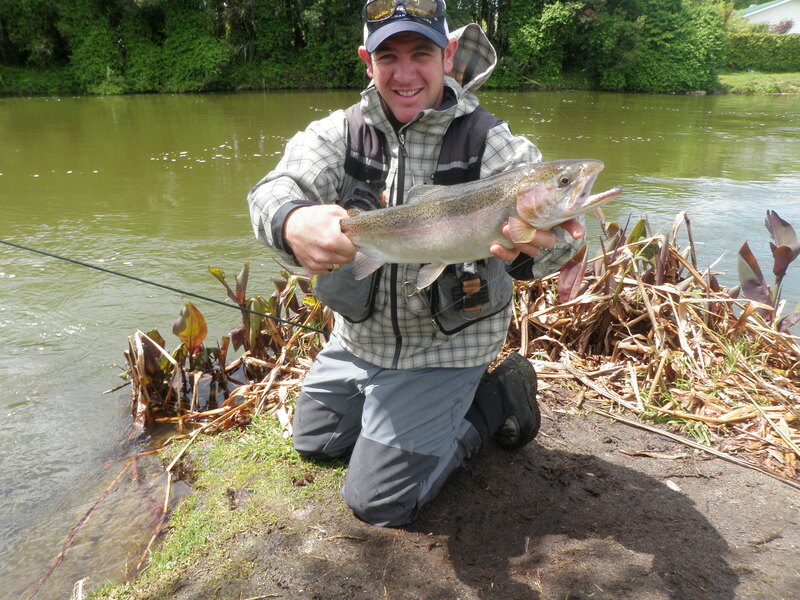 We did see about 4 fish actually caught by other anglers but nothing that was any bigger than something we can catch in the Tongariro from spot x in our nice clean water using 6lb fluro andÂ a light floating line. We had an interesting day with many laughs and it is now crossed of the list on the things to do but you can give the taupo fishery any day of the week, so lucky. Maybe and most likely we did not know what we were doing or it was just aÂ bad day, fishing is fishing after all! 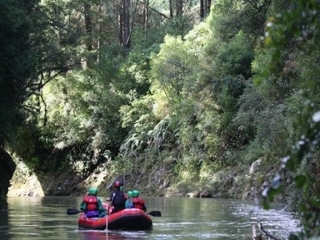 Rain is pouring down again as I sit at my desk but the weekend looks like it will be a good one through out the central north island and we should see you all here on the river I hope getting away for a long weekend. Any questions or queries on the rivers just give me a buzz only happy to have a chat and talk fishing. Have a great weekend.